Download "Gabriel Magariño. Software Engineer. gabriel.magarino@gmail.com. www.javapassion.com/idm. 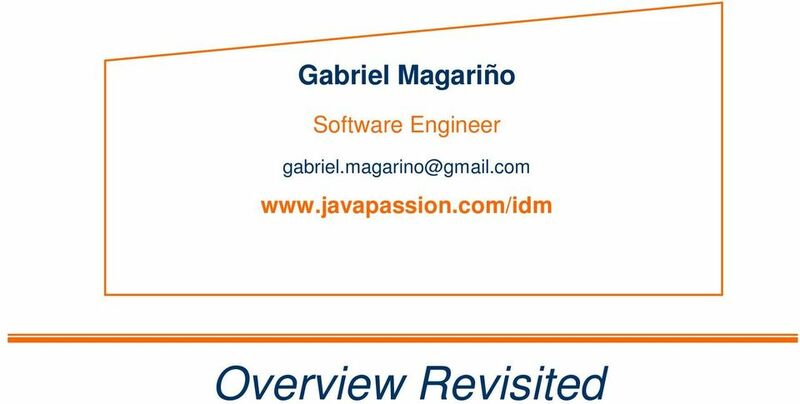 Overview Revisited"
3 What is IdentityManager? Sun IdentityManager makes it possible to automate the process of creating, updating, and deleting user accounts across multiple IT systems. This process is known as provisioning (that is, creating and updating user accounts) and deprovisioning (deleting user accounts). 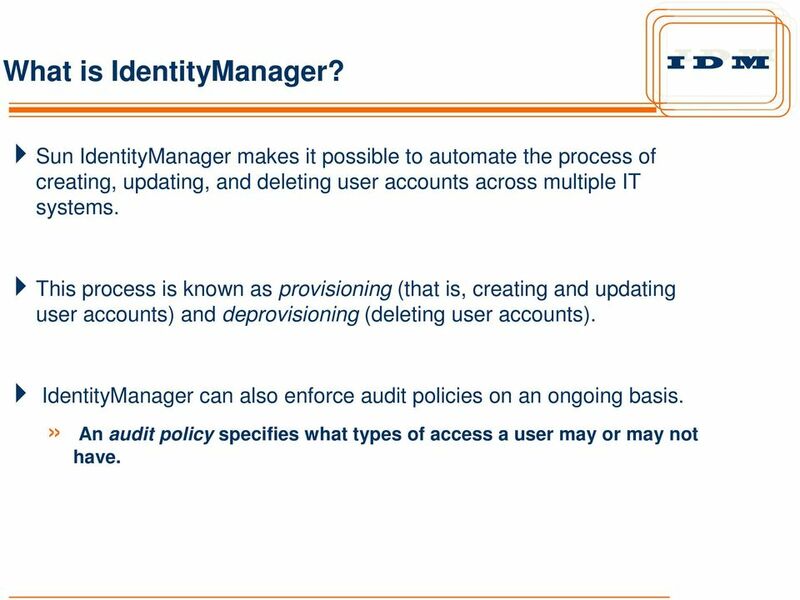 IdentityManager can also enforce audit policies on an ongoing basis.» An audit policy specifies what types of access a user may or may not have. 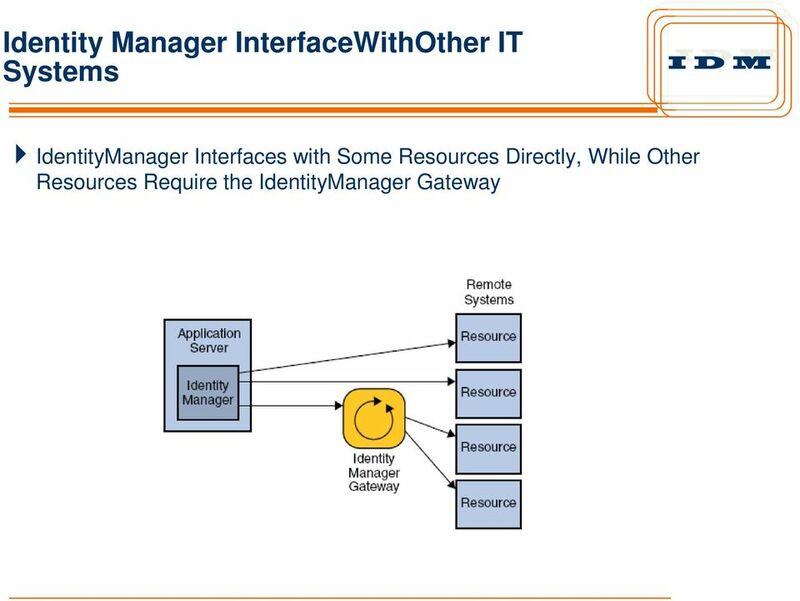 4 Identity Manager InterfaceWithOther IT Systems In IdentityManager, managed applications and other IT systems are called resources.» Identity Manager uses either adapters or connectors to interface with resources. 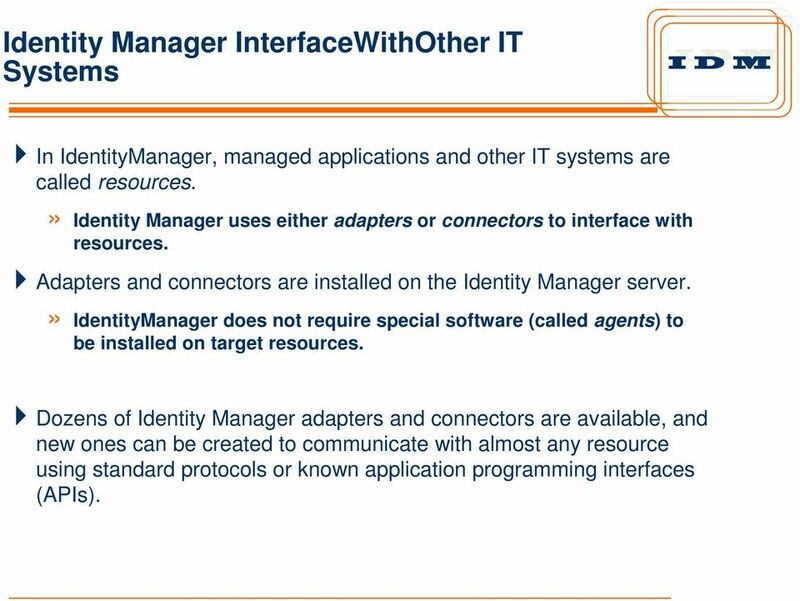 Adapters and connectors are installed on the Identity Manager server.» IdentityManager does not require special software (called agents) to be installed on target resources. 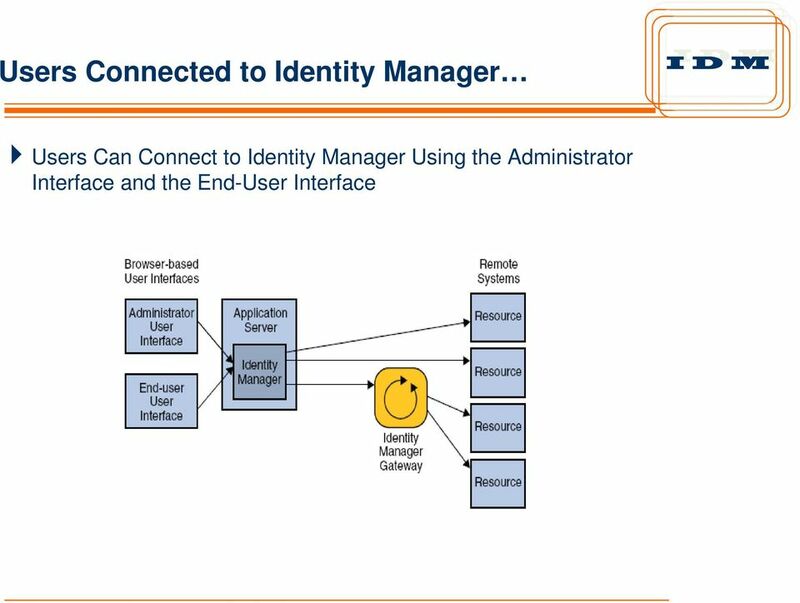 Dozens of Identity Manager adapters and connectors are available, and new ones can be created to communicate with almost any resource using standard protocols or known application programming interfaces (APIs). 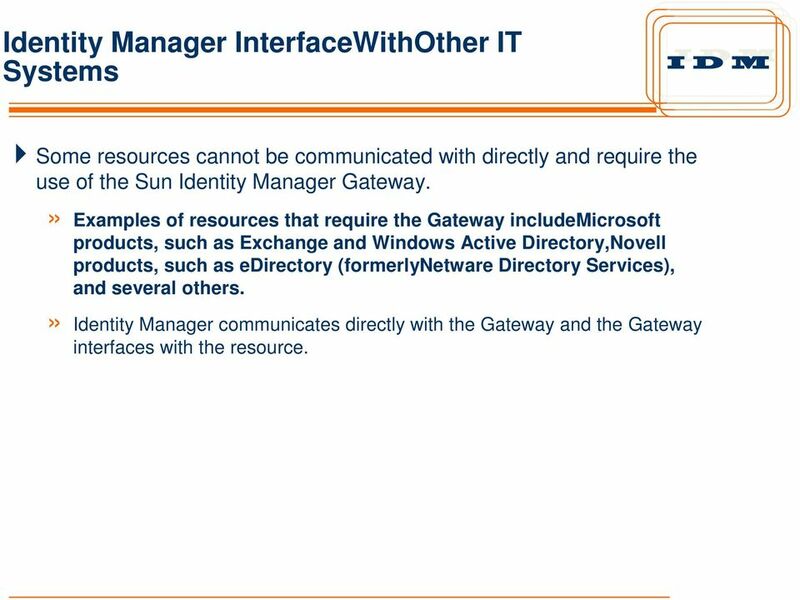 5 Identity Manager InterfaceWithOther IT Systems Some resources cannot be communicated with directly and require the use of the Sun Identity Manager Gateway.» Examples of resources that require the Gateway includemicrosoft products, such as Exchange and Windows Active Directory,Novell products, such as edirectory (formerlynetware Directory Services), and several others.» Identity Manager communicates directly with the Gateway and the Gateway interfaces with the resource. 7 Users Connected to Identity Manager IdentityManager has a user interface (UI) for administrators, and a separate interface for end users.» To use IdentityManager, administrators and end users use a web browser to log on to IdentityManager.» Administrators use the administrator interface to manage users, set up and assign resources, define rights and access levels, establish audit policies, manage compliance, and perform other business administrator and system administrator functions.» End users use the end-user interface to perform a range of selfservice tasks, such as changing passwords, setting answers to authentication questions, requesting access to IT systems, and managing delegated assignments. 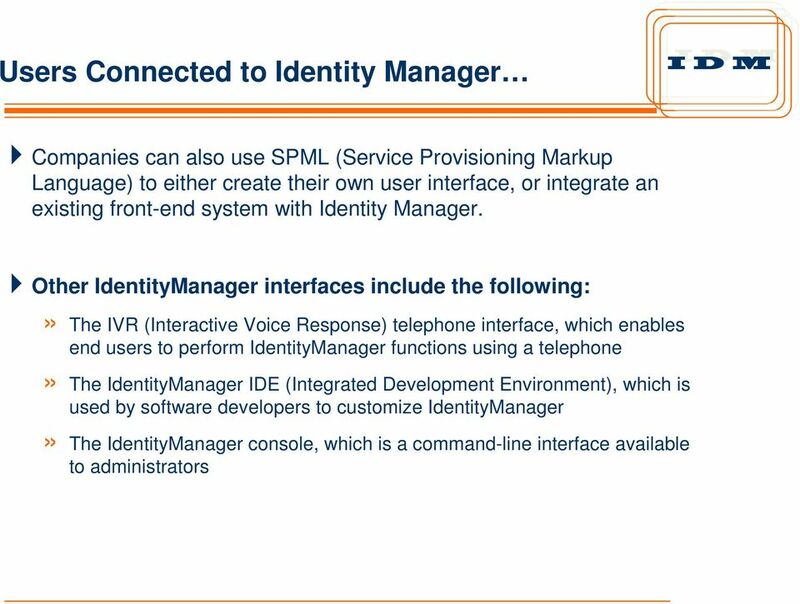 10 Identity Manager Service Provider Identity Manager Service Provider is a highly scalable, extranetfocused identity management feature that is capable of provisioning and maintaining millions of end user accounts that are stored on an LDAP directory server. 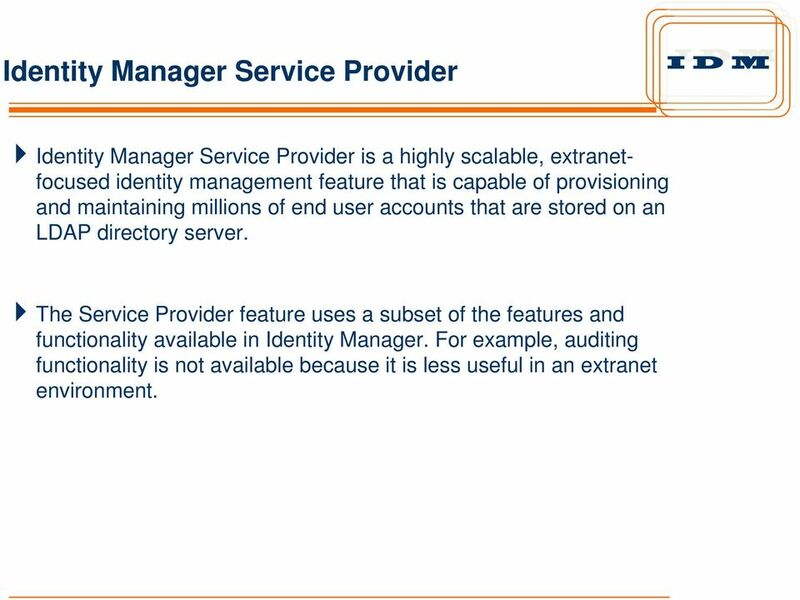 The Service Provider feature uses a subset of the features and functionality available in Identity Manager. 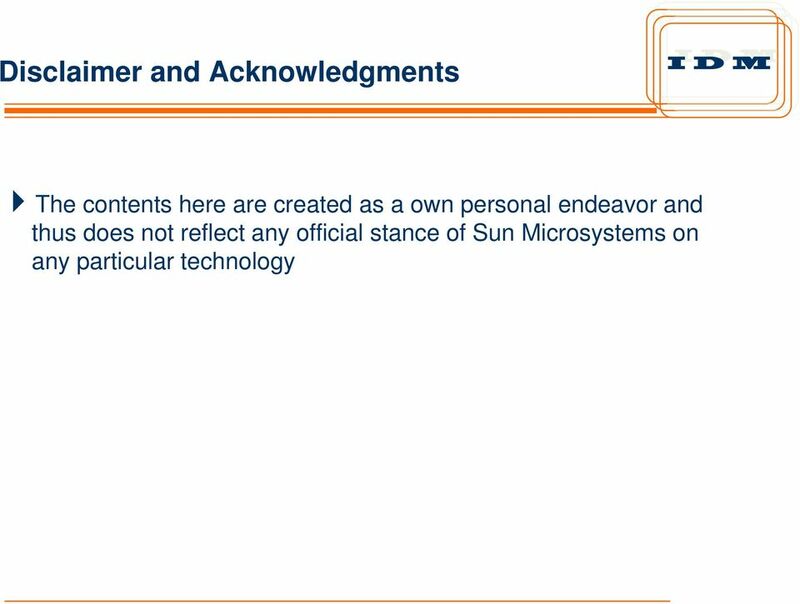 For example, auditing functionality is not available because it is less useful in an extranet environment. 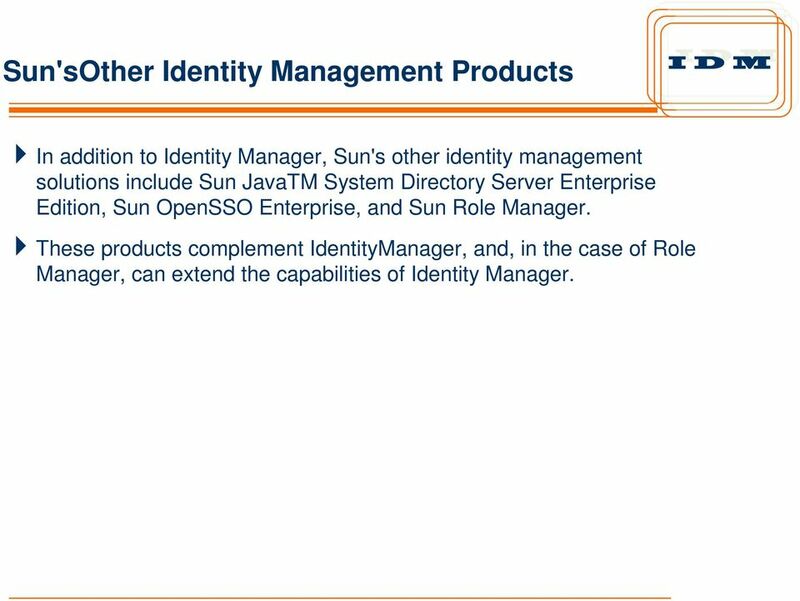 11 Sun'sOther Identity Management Products In addition to Identity Manager, Sun's other identity management solutions include Sun JavaTM System Directory Server Enterprise Edition, Sun OpenSSO Enterprise, and Sun Role Manager. 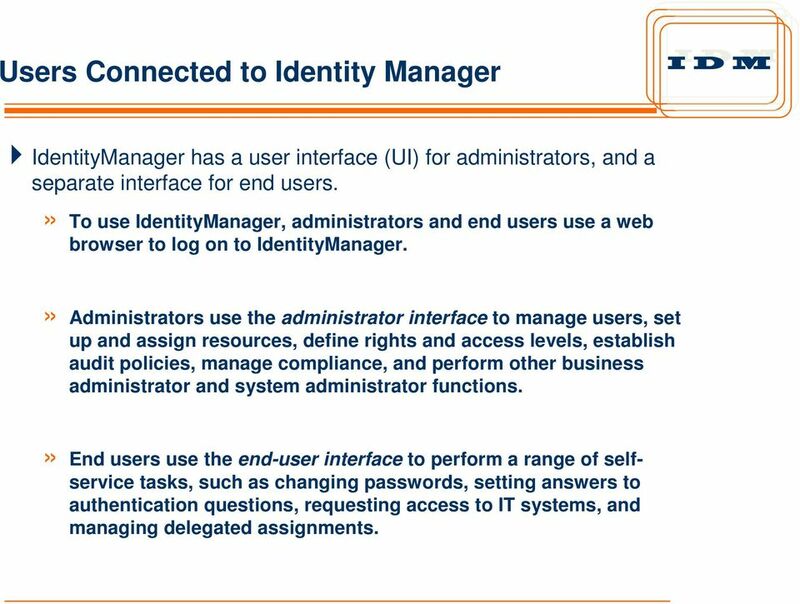 These products complement IdentityManager, and, in the case of Role Manager, can extend the capabilities of Identity Manager. 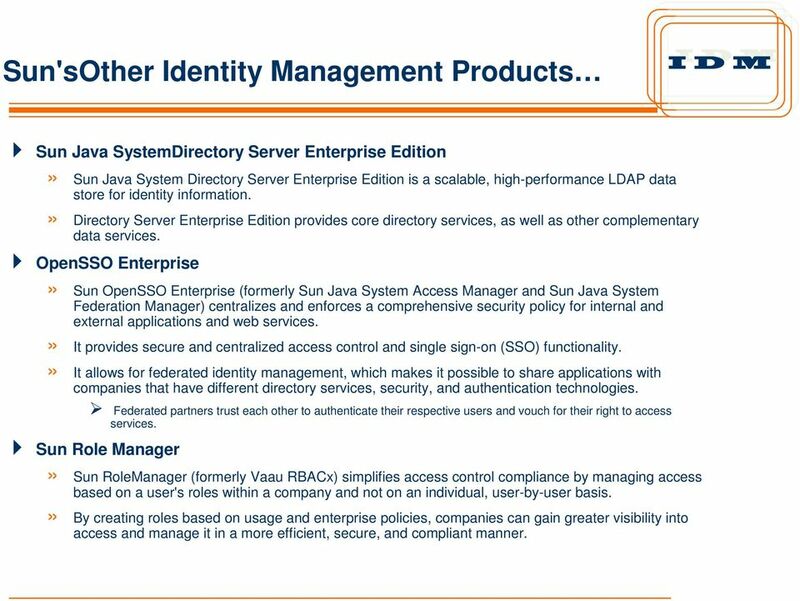 12 Sun'sOther Identity Management Products Sun Java SystemDirectory Server Enterprise Edition» Sun Java System Directory Server Enterprise Edition is a scalable, high-performance LDAP data store for identity information.» Directory Server Enterprise Edition provides core directory services, as well as other complementary data services. OpenSSO Enterprise» Sun OpenSSO Enterprise (formerly Sun Java System Access Manager and Sun Java System Federation Manager) centralizes and enforces a comprehensive security policy for internal and external applications and web services.» It provides secure and centralized access control and single sign-on (SSO) functionality.» It allows for federated identity management, which makes it possible to share applications with companies that have different directory services, security, and authentication technologies. Federated partners trust each other to authenticate their respective users and vouch for their right to access services. Sun Role Manager» Sun RoleManager (formerly Vaau RBACx) simplifies access control compliance by managing access based on a user's roles within a company and not on an individual, user-by-user basis.» By creating roles based on usage and enterprise policies, companies can gain greater visibility into access and manage it in a more efficient, secure, and compliant manner. EXECUTIVE VIEW. EmpowerID 2013. KuppingerCole Report. By Peter Cummings October 2013. By Peter Cummings pc@kuppingercole. For Managing Central Deployment, Policy Management, Hot Revocation, Audit Facilities, and Safe Central Recovery. Single Sign-On Security and comfort can be friend. Arnd Langguth alangguth@novell.com September, 2006 Identity proliferation in the enterprise Password management problem How many passwords do you have?